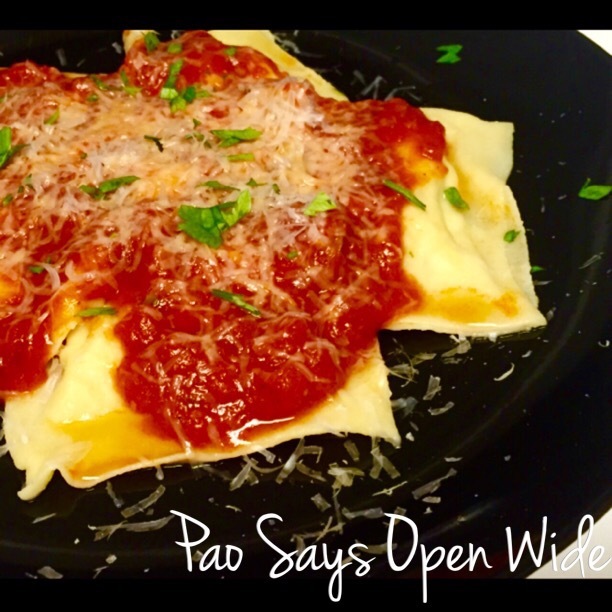 Post-Clinic Project: Turkey and Ricotta Ravioli in Marinara Sauce – Pao Says, "Open Wide!" With the use of my pasta maker, the whole dish took about 45-50 minutes to make. I rolled my pasta to a thickness of “5”- pretty thin. However, if you do not have a pasta maker, don’t let that limit you if you really want to make this. before I had my handy dandy machine, I would roll pasta out with a rolling pin wine bottle… have to make the best of your situation, and although I didn’t have a rolling pin at the time, you can bet I had some empty wine bottles. Anyways, you can definitely roll out your own pasta- it will just take a little longer. For the pasta dough, I combined 2 cups durum flour, 2 eggs + 1 egg yolk (set aside the white for the egg wash you will use later), a dash of salt, 2 tsp olive oil, and a splash of water and mixed them until they formed a dough. You have to judge if you need to add water once you have the ingredients combined- you want a dough that comes together but you don’t want it to be wet and sticky. Once combined, knead it for about a minute or two. Set the dough aside. In a hot pan, combine about 1-2 tbsp olive oil, the chopped onion, the garlic, the parsley, and the basil and cook until the onions are slightly translucent. Add in the ground turkey and about 1/2 + tsp of salt and 1/4 tsp pepper- you can add more seasoning once its cooked and you can taste it. make sure to break the turkey up as you cook it. *Tip* I used a potato masher to help break up the meat- it goes by more quickly and efficiently! Once the meat is cooked, set it aside in a bowl. Start to boil some water in a large pot (for the ravioli). While the meat cools, begin to roll out your pasta dough in 4 sections according to the instructions for your maker, or start to roll it out on a table (with flour dusted on it to prevent the pasta from sticking). You want the pasta to be pretty thin (thickness of 5 on the pasta roller dial). once you have your sheets, lay them out on a tabletop dusted with flour. Make sure your strips are about 3 inches thick as you lay them out (trim where necessary). Mix the turkey with the container of ricotta cheese and a tsp+ chopped parsley. Using a melon scoop or a small spoon, place the filling on one of the pasta sheets at a time. The scoops should be about no more than a tbsp and there should be about 1.5-2 inches between each of the scoops. Two of your 4 pasta sheets will have the ravioli filling on them. Once you have filling for each ravioli on the two long pasta sheets, beat the egg white you had left over from before with a splash of water for your egg wash. With your finger, or a small brush, coat the areas around the turkey-ricotta filling with the egg wash. Once you have the outlines of your raviolis ready with the egg wash, place the long pasta sheet over the one with the filling and begin to press around each of the scoops to seal them in and create your raviolis. I found that this worked better when done from one side to the other along the long sheets, ensuring to press out any air pockets that may form. once the pasta sheets are pressed together, cut the raviolis (I used a pizza cutter) and cook them in the boiling water for about 2 minutes. While they are cooking, put the marinara sauce in a bowl and pop it in the microwave to heat for about 45 seconds. Loosen the sauce a bit with 2-3 tbsp of the pasta water. Once the ravioli are floating up at the top of the boiling water, remove them from the pot using a slotted spoon and plate them. Pour some sauce and parmesan cheese over them and voila! You’re eating a fresh, delicious, home-made Italian dish! Ahh thank you! I think you’ll be really happy with the results once you give it a shot- you’ll get the hang of it after one or two runs 🙂 good luck! !